"Should I tell your wife and your son who you really are?" 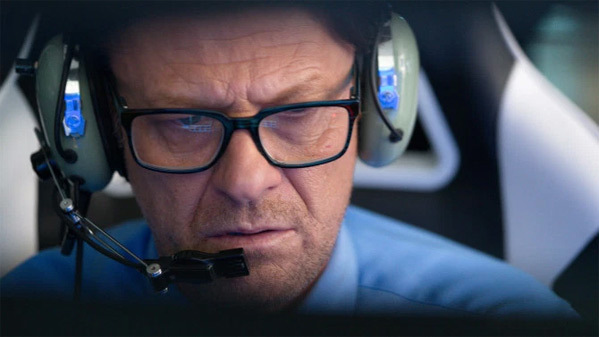 Screen Media Films has launched a trailer for Drone, yet another movie about drone pilots, this one featuring Sean Bean. Yes, that Sean Bean, the one from Lord of the Rings and "Game of Thrones". Drone is about a father who is secretly a drone pilot who spends his workdays flying covert missions then returns to family life. Everything changes when a Pakistani businessman, who feels he is responsible for the deaths of his wife and child, tracks him down leading to a harrowing confrontation. Starring Patrick Sabongui, Mary McCormack, Joel David Moore, Sharon Taylor, and Kirby Morrow. This looks intriguing, but pretty much the same as all the other drone films. Neil (Sean Bean) is a private drone contractor who spends his workdays flying covert missions then returns to a family life of suburban mediocrity - without his wife or son knowing about his secret life - until a whistle-blowing site exposes him to a deadly threat. Believing he is responsible for the deaths of his wife and child, an enigmatic Pakistani businessman (Patrick Sabongui) tracks him down, leading to a harrowing confrontation. Drone is directed by veteran Canadian filmmaker Jason Bourque, of the film Black Fly previously as well as lots of television movies/episodes. The screenplay is co-written by Jason Bourque and Paul A. Birkett; from a story by Paul A. Birkett, Ian Birkett, and Roger Patterson. Screen Media Films will release Bourque's Drone in select US theaters starting May 26th this summer. Your thoughts?